Designed for applying large labels requiring extensive pressure, these 7 to 15 ton machines are ideal for decorating everything from large buckets and pails to cases and garbage cans. PLC control system and color touch-screen operator interface unit with resident help menus & digital photo library. Adjustable speed, motor-driven foil web advance system including DC motor, motor control, and speed adjustment dial. 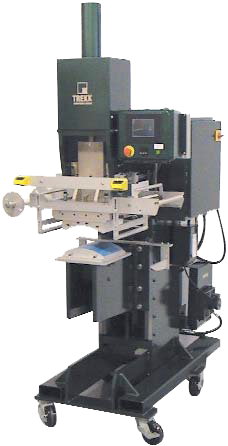 Dual palm button press safety control with anti-tie down, anti-repeat, and pinch point interlocks. Digital solid state proportioning temperature control with J-type thermocouple. 240-volt or 480-volt input power (customer may specify). Main electrical enclosure with electrical disconnect switch. Industrial-grade, double acting hydraulic stamping cylinder. Fine-tune stroke adjustment capability on stamping cylinder to provide precise control over stamping imprint depth. Self-contained hydraulic power unit with motor, hydraulic pump,tank reservoir, pressure gauge, and pressure regulator. Quick change web payout & take-up systems (no tools required). 12-inch wide foil web feed capacity. Floor model frame with locking castors. Heavy duty precision machined ram with vee gib guide system. Metal components clear anodized, electroless nickel plated,or painted as needed. 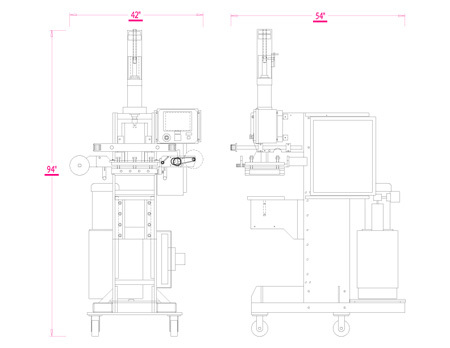 Equipment and tooling subject to change pending review of project specifications and sample parts. Automated, high-speed and additional safety features available to customize equipment to your production needs.